﻿A drug bust gone wrong brings D.E.A. agent Orlando Trip Spencer back to his hometown of Atlanta after being gone for years and he is not the only one unhappy about the return. Idalis Arrington and Trip have been best friends since they were little and or nobody could come between them, that is until she meets Lincoln Briscoe. With Trip back in town Idalis perfect world starts to get messy as she finds herself praying that her best friend s visit is a short one. But the question is can she hold it together or will the sound of the skeletons in her own closet drown out what she s convinced herself has been the truth all these years? Lincoln Linc Briscoe, a Lieutenant with the Atlanta Police Department, knows he has a lot at stake and his girl s best friend or not he refuses to let anyone, especially Trip Spencer, jeopardize what he s worked so hard to gain. Will Trip and Lincoln be able to avoid the collision course they ve been on all these years or will they collide and explode, taking down everyone, including their careers, in their wake? Can Idalis handle the pressure brought on by Trip and Lincoln s animosity or will she crack revealing her own shortcomings? There is no telling what can happen when the truth is revealed: BETWEEN FRIENDS. 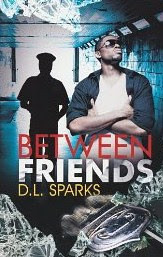 In Between Friends by D. L. Sparks, readers step into a world of investigations and mischievous behavior. Trip Spencer had no intentions of going back to his hometown of Atlanta until he is assigned to work a case involving the killings of well-known drug dealers. Trip tries to look at the bright side because he will be able to see an old friend. While investigation Trip realizes his case is starting to hit close to home. What will Trip do once he finds out whose behind all of the foolishness? Idalis Arrington old feelings start resurface when she finds out her close friend Trip will be coming home to lead an investigation. Idalis forgets that she is currently engaged to Lincoln Briscoe and he is not happy that his woman’s old friend is coming back into her life. Idalis knows the tension this will bring but she cannot help the way she feels toward Trip. Lincoln’s jealousy, the pressure of planning her wedding among other family issues starts weighing on Idalis mind. Will Idalis ignore the signs or will she listen to her heart? Between Friends is an entertaining book about deception, secrets and acknowledging true feelings. When a person looks for trouble they will definitely find it especially in this book. I was thrilled with the characters and the plot was consistent and well structured giving me a little bit at a time to keep me interested. I recommend Between Friends to others.